For the first ten minutes on Saturday, the Manly Sea Eagles looked like the Manly of old. They were smashing Souths in every department; however, unlike the Manly of old, who would have gone on with the job, the current squad crumbled when Souths changed the momentum of the game. These changes stem from a multitude of factors at the club. Firstly, the recruitment in the offseason was below par. Curtis Sironen, Akuila Uate, Jackson Hastings and Blake Green are not the big-star player hirings that will get Manly out of trouble. Uate has struggled with form the past few years and was barely playing first grade for the Knights. Sironen felt out of favour at the Tigers and really only received an offer from Manly due to his last name. Hastings, like Sironen, felt out of favour at the Roosters and likewise found his way to Manly thanks to his surname. Triple M commentator Dan Giannane tweeted: “An absolutely absurd stat: Blake Green’s record with his halves partners. 34-13 with Cooper Cronk. 1-23 with all the others”. This is more a testament to the Storm system and how Craig Bellamy turns average players into good players. Blake Green's record with his halves partners. All that being said, the recruitment in Manly has been subpar in recent years. Further, the recruitment of the coach Trent Barrett was questioned by the media at the time and is still questioned to this day. Missing the finals in his first year as coach at a club who had not missed the finals in over a decade is not a good start. Not all players make good coaches – an example of this is Brad Fittler, and Trent Barrett may join this club if he can’t turn around Manly sooner rather than later. 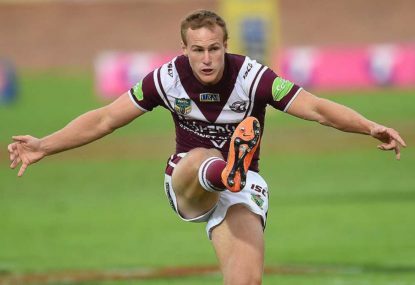 If the Dragons are copping flack for signing Ben Hunt to a million-dollar deal, it’s time to turn to Manly and ask why Daly Cherry-Evans was signed to an eight-year deal. Daly needs to start living up to his big pay packet deal. When Manly was going through that great period of dominance as perennial premiership contenders they had great players, but since those players have left, Daly Cherry-Evans has not replaced them with the brilliance Manly fans have been looking for. As Darren Lockyer said, “It seems counterintuitive, but as a player the best thing you can do when you are trying to get your peak form back is to stop looking for the money play. If Cherry-Evans can do that, he might live up to his price tag – but there’s little sign of a turnaround at the moment. It has been reported that there’s a power struggle between CEO Tim Cleary and Bob Fulton. It’s been heard that Clearly wants to diminish Fulton’s power in the club. These off-field distractions are the last thing Manly need after a 0-2 start for the season. Finally, the first two months of the season are crucial for Manly – with games against the Cowboys, Dogs, Roosters, Dragons, Storm and Raiders in the next six weeks it is a possibility that Manly can go down 0-8. And if Manyly start the season 0-8, heads will roll.